The real lives of border-crossers, assumptions that held back the South Bay’s craft beer scene and more in our weekly roundup of arts and culture news. San Diego just can’t shake meth. In the ’80s and ’90s, the county earned the title as the meth capital of the nation. It’s since become known for better things, like its designation as a craft beer capital status, but a Justice Department report last year found that the meth epidemic is still in full force here. The supply now comes from Mexican super labs that have replaced the clandestine mom-and-pop meth labs once scattered across the county, and, according to the report, those labs are pumping in a much cheaper and more potent product. A new play by local playwright Mabelle Reynoso attempts to reframe San Diego’s meth problem and show folks how the drug and the people who use it have changed. “We have this perception that it only affected certain types of people and it kind of stayed in the East County, but now it really is everywhere and used by all kinds of people,” she said. Reynoso’s script is based on interviews she did with local prison inmates, kids at juvenile halls, parents of kids struggling with addiction and people in recovery. She said the interviews taught her that younger people who missed the more fervent anti-meth campaigns of past decades don’t think the drug is as gross and disgusting as older people do. She also learned that a play directed at current meth users would be pointless – everyone she interviewed told her she had to target it toward kids who’d yet to even touch the drug. Reynoso was commissioned through a collaboration between Playwrights Project and SAY San Diego. The groups plan to pass out the script to high schools so student groups can present it themselves. “Other People’s Kids” will be presented alongside another play about addiction at San Diego State University’s Experimental Theater at 7:30 p.m. March 16 through March 18, with a matinee show at 2 p.m. March 19. Reynoso said she’s using the live performances to continue making tweaks and edits, but that the real-life basis of the script has planted the play on solid ground. “Because people were so willing to be vulnerable and share their stories and just lay it all out, I think I was able to put together something that really tells a powerful story about how this drug can really disrupt someone’s life,” she said. There’s a lot of talk focused on the U.S.-Mexico border. 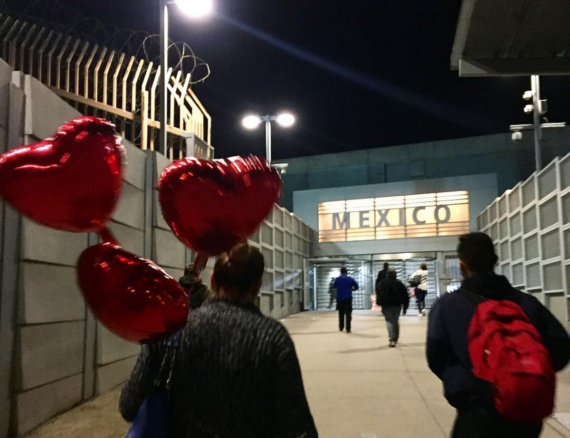 Melinda Chiment, executive director of The AjA Project, said the conversation has been missing something crucial – actual stories from people who cross the border on a regular basis. Enter Borderclick, AjA’s participatory photography project that helps local students and young adults document their binational lives. “The goal is really to capture the everyday aesthetic of the trans-border experience,” Chiment said. Funded by a grant from the California Arts Council, artist and photographer Rebecca Goldschmidt has been leading workshops and meeting weekly with a core group of about a dozen people who are now documenting their border-crossing through the project. From 5 to 8 p.m. Thursday at San Diego State’s downtown gallery, some of the Borderclick participants and binational artist Omar Pimienta will lead a talk about life on both sides of the border, documentation as a tool for social justice and more. Borderclick will also culminate with a pop-up installation that will travel to various sites in San Diego. The installation will include 360-degree videos, audio and other content the participants have been collecting. The project will also include a series of panel discussions focused on some of the issues they’ve encountered in their binational lives and possible solutions. “We will be using the Borderclick art as a springboard for some really important conversations,” Chiment said. • Artist Shinpei Takeda made the cover of last week’s issue of CityBeat. It’s a well-deserved honor for Takeda, the founder of The Aja Project nonprofit and an artist whose work has wowed San Diego art aficionados for years. Takeda’s in the news because of his latest project, which opens March 16 at the Mesa College Gallery. The artist has made a woven, tent-like installation and he’s asking people to schedule a time via email to sit with him inside the tent and talk about their personal phobias. • The annual San Diego Latino Film Festival is March 16-26 and the Remezcla website says this is everything you need to know about it. • Space 4 Art is hosting its final exhibition in its gallery space Saturday. The East Village building where the nonprofit is housed was sold last year, but Space 4 Art leaders say they are well on their way toward building a permanent home in Sherman Heights. • Experience immersive art installations, musical performances and a talk with local scientists and artists on climate change and other topics at this unique event at A Ship in the Woods in Escondido. • CityBeat talked to the curator and an artist from the “Ni Solo Mujeres: Intersecting Chicana Identities” group exhibition showing at Southwestern College Art Gallery. • KPBS had me on its Midday Edition show to talk about my recent Culturecast episode covering San Diego street performers who say the city codes and ordinances that regulate them violate their rights. A group of buskers showed up at the City Council meeting Tuesday to ask city leaders to help. • A San Diego-sprung musical is opening on Broadway Sunday. • The MovieMaker website interviewed the city of San Diego’s film program manager Brandy Shimabukuro about what makes San Diego a good place to make a movie. I talked to Shimabukuro last year about her role in the reboot of the San Diego Film Commission. • The San Diego Storytelling Festival is happening this week. • Ashley Awe’s op-ed in The Triton ties the “erosion of campus culture” to UCSD’s dismally low number of arts and humanities students. • Check out the sonic experimentation happening in Logan Heights this weekend. • SDSU’s University Dance Company is exploring bi-national dance. • Ground just broke on the new Southcrest Trails Neighborhood Park, which will include public art by local artists and married couple Ingram Ober and Marisól Rendón-Ober. • Y’all desert flower-seekers will encounter an art show if you head out to Borrego Springs this weekend. • The San Diego International Airport unveiled a new temporary exhibition focused on works that explore celestial phenomena and astronomy. • Moxie Theatre and the Museum of Photographic Arts both closed last week in observance of International Women’s Day and#DayWithoutAWoman. • Helmuth Projects gallery in Bankers Hill is asking patrons for donations to help keep programming going. • The super cool Central Library’s Human Library event allowed people to “check out” stories by real San Diego community members by sitting down with people and having 15-minute conversations with them. • Voice of San Diego contributor Ian Anderson wrote about a new county ordinance that will make it a lot harder for you to enjoy food while hanging out at local craft breweries. And VOSD contributor Jonah Valdez talked to the folks behind South Bay’s mini craft beer boom and long-held assumptions about why craft beer couldn’t flourish there. • Aloe vera isn’t just for rubbing on your wounds; people are mixing it in their cocktails and San Diego Magazine says it’s delicious. • The New York Times frugal traveler dropped in on San Diego and did all sorts of fun-but-cheap things (mostly eating and drinking). • The new You & Yours East Village distillery is the brainchild of Laura Johnson. The Reader talks to Johnson about her experiences in the craft spirit industry. • Salt and pepper are often nowhere to be found when you sit down at a trendy San Diego restaurant. San Diego’s Troy Johnson continues his deep dive into self-proclaimed “earth-shattering discussion” about where salt and pepper have gone and why. • Little Italy’s Loading Dock restaurant opens Saturday. • James Coffee Co. opened a new retail store that sells home brewing equipment and other goods. • San Diego’s “Craft Beer Attorney” made an appearance on San Diego Magazine’s Happy Half Hour Podcast. I wrote about the attorney and her problems with calling herself that last summer.